Growing Up With Antibiotics, Growing Up With Asthma? In the latest (but probably not the last) research to associate antibiotic use during infancy with the development of asthma, three studies suggest exposure to antibiotics (either prescribed to the pregnant mother or the child during the first year after birth) increases the risk that the child will suffer from asthma. 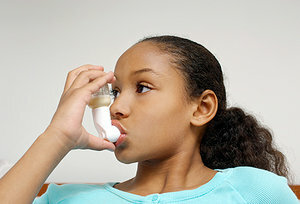 The first study found that “both prenatal (before birth) and post-natal exposure to antibiotics was associated with an increased risk of asthma.” Building on this, the second study noted: “Antibiotic use in the first year life is associated with an increased risk of early-onset childhood asthma that began before 3 years of age. The apparent effect has a clear dose response” (the more you take, the greater the risk). The third study compared babies born in urban areas with those born in rural areas. While a number of factors increased the risk of asthma, “the use of antibiotics” was one factor contributing to development of the condition, particularly in urban areas. Talk to your doctor about the risk-benefit profile of any medication you’re prescribed / recommended (including over-the-counter products); then make an informed decision on whether it’s worth the risk.